Sample shown with Fuchsia ink and Azalea Glossy lining. Sample shown with Grey ink and Grey Glossy lining. Sophisticated style abounds with classic elegance! 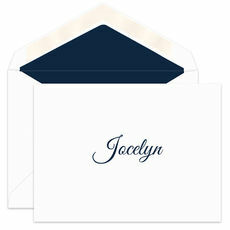 Your personalization centered on a 6.25" x 4.625" foldover note card with blank matching envelopes. 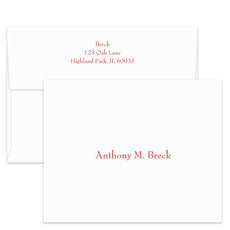 Available on bright white or ecru stock with your favorite raised ink color. Lined envelopes and flat printed return address available. Typestyle and positioning only as shown.